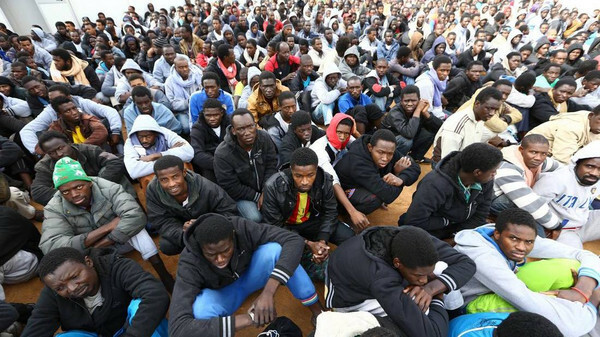 Geneva- The continued use of military force, cruel treatment and deliberate negligence of African migrants by Algeria and Libya will have dire consequences, warns he Euro-Mediterranean Human Rights Monitor and the International Humanitarian Law Center. These acts also constitute a flagrant violation of international law, the two organizations added in a joint press statement issued on Friday. In Algeria, hundreds are forcibly deported to the Sahara, and are left without water or food as a prey to death or to the exploitation by traffickers and smugglers. Illegal immigration has been a growing humanitarian and security crisis for many countries in recent years. However, the two organizations stated this cannot justify the difficult procedures and conditions placed on migrants in Libya and Algeria, especially in bordering towns, where dozens of them are subjected to a dehumanizing treatment. A vehicle carrying illegal immigrants to the east of Kufra District in south-eastern Libya on May 14 was hit by an airstrike. According to eyewitnesses, the aircraft came from Egypt, resulting in eight Eritrean nationals wounded. Currently, they are receiving treatment at Al-Kufra General Hospital, which lacks the most basic medical and humanitarian services. Carried out for alleged security reasons, the airstrike is part of an ongoing operation targeting migrants in the Kufra District, an area bordering Libya, Egypt and Sudan. Migrants who are subjected to arbitrary arrest and forced detention is not a few, while dozens are being forced to fight for money as mercenaries in the southern Libyan city of Sabha, which has been locked in armed conflict for more than a month among tribal groups. Several members of the Libyan security forces were responsible in some way for the orture, detention and inhuman treatment of migrants in shelters or detention centers, the two organizations reported. A woman from Ethiopia said in her testimony that she was physically assaulted more than once by smugglers during her entry into Libya and even after being arrested by Libya's Anti-Illegal Immigration Department (AIID) in detention centers, according to several reports, which requires a serious investigation into these incidents. In Algeria, there has been a marked increase in deportations since the second half of last year (2017) and the first few months of 2018. These African migrants come from sub-Saharan Africa, particularly Niger, Cameroon, Guinea, Nigeria and Mali. The problem is that most of the deportations are carried out collectively, without a real case-by-case examination. At least half of the deportees were not screened for their passports before being expelled. In many cases, migrants were arrested from their workplaces or from the streets and deported immediately without even being allowed to bring in their belongings and passports. Migrants said they were deported in a humiliating manner. They were first held in military bases under tragic conditions without bedding and with little food for several days. Some were insulted, humiliated and beaten by security forces. They were transported in large trucks and stacked up to 1,900 kilometers from Algiers to the Niger border. They are then left, in many cases with their children, some 30 kilometers away from the border in the desert, often without water or food. IOM recorded the deaths of many of those in sand dunes without being able to identify them. The fight against illegal immigration is not a justification for the use of military force to bomb immigrant vehicles, abuse immigrants in official detention centers or deny them the right to return to their country of origin safely, Euro-Med Monitor and the Center for International Humanitarian Law stressed. “It is clear that the acts we have documented constitute a flagrant violation of the most basic of human values and legal norms enshrined in international treaties and conventions, which affirm the right to asylum and to movement while ensuring human dignity, respect for privacy without assault to one’s life under any circumstance,” said Moussa Al Kneidi, a researcher at Euro-Med Monitor. “Any attack on migrants from any individual affiliated with any official Libyan or Algerian security establishment is a reflection of the state's lack of respect for its international obligations, norms and respect for human rights principles,” Al-Kneidi added, stressing the need for an official position of the State with regard to these violations, and for holding accountable those responsible. Euro-Mediterranean Human Rights Monitor and the Center for International Humanitarian Law call on the Libyan and Algerian authorities to fully abide by the international conventions they have ratified, which affirm respect for the rights of refugees and migrants. They also call for monitoring of the commitment of security personnel to dealing with migrants in a respectful manner, and for examining their cases individually, treating them according to human rights norms. The two organizations further call on the legislative authorities of the two countries to work on amending the legislation in line with the 1969 OAU Convention relating to African refugees, recommending that Libya accedes to the 1951 International Convention on Migration and its 1967 Protocol.